There is never a point in any profession where you will be the best at what you do. I know this sounds harsh, and there will be many people who disagree with me, but this is my utmost belief, and I think it is one of the healthiest ones to have. The moment you start thinking you have achieved the pinnacle of your success and don’t have to work any harder to be better, is the moment you start to fail. There is never a point in your life where there won’t be some sort of goal on the horizon: whether that is a financial one or a personal one (e.g. weight loss, a special someone, etc.). It is so important that you are always aiming to be better at what you do because it keeps pushing you to train. This is certainly true for anyone playing sports. Being a professional sports player, or simply playing amateur sports, requires you to consistently train. It is something that goes hand in hand with being a sports player, and you will never reach a point where you are “beyond” training. If you look at all the best soccer players right now, male and female, they are all still consistently training every single day. 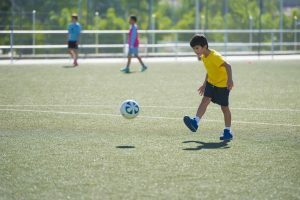 This is because they understand how important their basic exercises are to keep their bodies in shape and enhance the skills they already have. 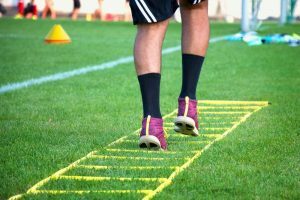 Staying up to date with your soccer training exercises is the key to become a more well-rounded player. It strengthens your ability as an individual, as a team player, and as a strong leader on the field. There are so many soccer training exercises that you can take on that will push you to achieve your personal best. To me, there are three primary areas in which to train while doing your soccer exercises. They are passing, shooting, and dribbling. While there are certainly other aspects to focus on (such as throw-ins, etc.) these are the three primary ones I want to focus on today. If you consistently train in all three of these, I promise you will see results in a matter of a week. Soccer is all about team-playing. Even if you have the greatest players in the league, if they don’t work together as a team, without a doubt they will fail. This is because you team needs to come together towards the common goal of winning. Whether you are on offense or defense, or a goalie, never focus on just you but all your players around you. 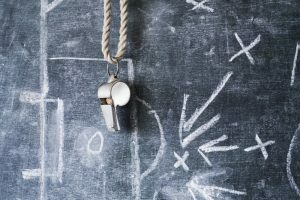 The biggest technique you can learn that complements team-play is passing. This is pretty much self-explanatory, as soccer comes down to you putting the ball in the opposing team’s net. That being said, you constantly need to be using soccer training exercises that will strengthen your shots, and also give you the accuracy you need in order to follow through with a goal. 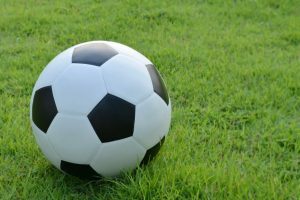 The most basic soccer training exercises you can do to improve all of this is simply line your team up at the top of the box and put a goaltender in net. Have them all shoot one at a time to see what every individual player needs to work on. This is a technique that you simply must master if you are to play soccer. There are multiple soccer training exercises to improve your dribbling skills but the best one of all is also the most basic. It is simply getting with a partner and have one of you on defense and the other on offense, and dribble the ball to avoid getting it stolen. The pressure needs to be put on in order for you to enhance your dribbling ability. The best part about the Internet is there are many soccer training exercises and videos available to you to enhance your playing ability. Check them out today!